"Her Highness, the Noble in Greatness, the Sun of the Heaven of Chastity and Continence, Famous for Nobility and Honour and Piety, Gauhar Shad, may her Greatness be eternal, and may her Chastity endure and may her Charity increase with true Thought and high, and with Pious Intent of Heart of Lofty Ideal for fulfilling and accomplishing her hopes in Allah, may He accept it; from her private property for the benefit of her future state and for the Day on which the Works of every one will be judged, with Zeal for Allah and with desire to please Allah and with Thankfulness for the Benefits of Allah and for Praise of the Benefits granted by Allah, built this Great Masjid-i-Jami, the Holy House, in the era of the reign of the Great Sultan, and the more Just Khakan, the more Generous, the Lord of Rulers of the Arabs and of Ajam, the Sultan, son of a Sultan, the Father of Victory, Shah Rukh, son of Timur Gurkani, Bahadur Khan. May Allah make eternal his Kingdom and Empire ! And may he increase on the inhabitants of the world his Goodness, his Justice and his Generosity ! Thus may Allah accept her work with beneficent acceptance and may He bless her with His choice blessings and may He grant her the greater of the boons which He has promised to the good! Baisunghur, son of Shah Rukh, son of Timur Gurkani, wrote this inscription with hope in Allah in 821 (1418)." The above inscription was translated by Sykes P. M. (1915) in his book 'A History of Persia'. Mosaic faience has been defined as the covering of an architectural surfaces with a patterned arrangement of closely fitting small pieces of tile which have surface glazes of various colours. In this monument it was displayed in a masterly fashion. Although the palette included several colours, dark blue, light blue and white set the prevailing colour harmony. On the minarets small decorative panels were set into backgrounds of baked brick; whereas in the panels on the wall surfaces the decorative elements and patterns were raised a few centimetres above the mosaic faience ground. Strangely there is no evidence of the continued use of architectural faience in Iran after the time of Alexander's conquest in 331 B.C…It was not until long after the Muhammedan conquest that architectural faience was revived-or rediscov ered. The revival, slow and reticent at first, quickly gained momentum and reached its zenith in the fifteenth century when whole buildings were sheathed inside and out in elaborate patterns of glazed brick and faience mosaic. The many magnificent buildings of Timur at Samarkand, the great mosques built by Gawhar Shad at Meshhed and Herat, the famous blue mosque of Tabriz and a whole series of buildings at Isfahan and Yazd still stand. Another important building technique was the use of the double-shelled dome to lighten and strengthen the structure. In Iran, the oldest examples of this technique appear in the Kharaqan tombs in Zanjan province, built at the beginning of the 11th century. This technique enabled the inside and outside of the dome to be designed at different shapes. Good examples are the spectacular Timurid and Safavid domes, such as those of the Gur Amir mosque at Samarqand (1434) and of the Shaykh Lotfollah and Royal mosques in Esfahan (1598 and 1611). p152. Loveday H. Wannell B., Baumer, C., Omrani, B. (2005). Iran, Persia Ancient and Modern. Odyssey Books and Guides, Hong Kong. The mosque-mausoleum, built at Turkestan over the tomb of Hazret Khodja Ahmed Yesavi by Timir, which was commenced in 1387 and finished in 1404,6 has a huge dome, similar in shape to that at Sultadiieh, but the double dome soon became general. From Samarkand it passed to Khurasan, over which it was spread by the Timurides then ruling at Herat. In the mosque built at Meshed in A.D. 1418 (according to Khanikoff) by Gawhar Shad... the dome, according to O'Donovan, ‘has something of a bulbous shape’, and is, I conclude, double. ...Mosque of Gawhar Shad in Meshed, built in ca. 1405-1419, was the first building, now standing in Persia proper, to be decorated with a bulbous dome. "It needs no acquaintance with other styles to acclaim this court, among the buildings now existing, as the most beautiful example of colour in architecture ever devised"
Robert Byron (1905-1941). British Travel Writer. Author of The Road to Oxiana. 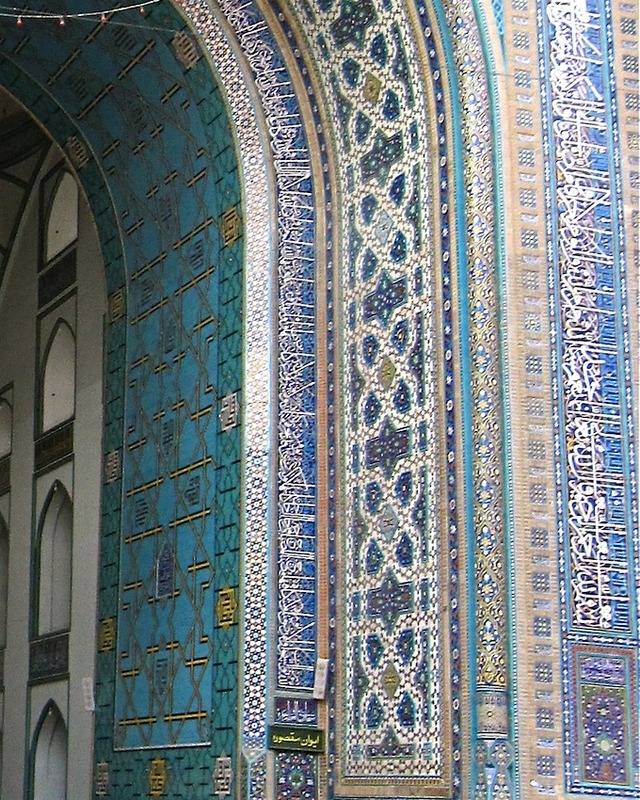 A separate page dealing with Timur and some background to Timurid Architecture is here. The following extract is taken from, Pope, A. U. (1969) Persian Architecture. Oxford University Press: London. 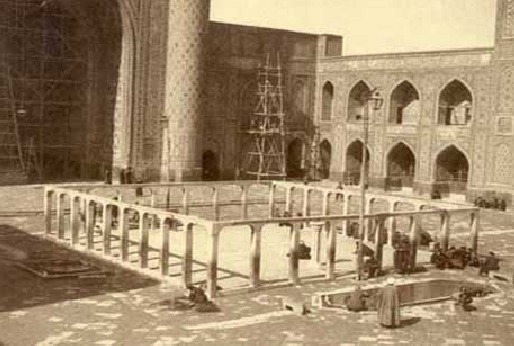 The first and the greatest surviving, Persian monument of the fifteenth century is the beautiful mosque of Gawhar Shad (1418) now abutting the shrine of the Imam Reza in Mashhad. Its portal continues the Samarkand style of arch within arch, enriched by a succession of bevels and reveals that give it depth and power. The thick, tower-like minarets, merging with the outer corners of the portal screen, extend to the ground and, together with the high foundation revetment of marble, give the ensemble the impression of solidity necessary to support its exuberant colour. The entire court facade is faced with enamel brick and mosaic faience of the finest quality. The full scale of colours includes a dominant cobalt blue and turquoise, white, a transparent green, yellow, saffron, aubergine and mirrorblack - all tones fluctuating through several shades. The patterns lucid and vigorous, are artfully adapted to their decorative role, whether for eye-panels, or dome ornament meant to be effective at a thousand feet. Monotony, difficult to avoid in such a large area, and a distracting intricacy that might compete with the essential architectural forms are both forestalled. This is accomplished by the energy of the faience floral patterns and brick geometrical schemes; by the emphatic rhythm of the arcades, open galleries and deep recesses; and especially by the contrast of the ivans. Hillenbrand (1994:3107) says, 'The Timurid period took still further ideas which had been no more than latent in earlier centuries. 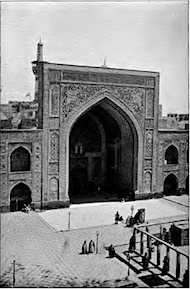 While some mosques of traditional form were built - such as the Mosque of Gauhar Shad, in Mashhad, of standard four-iwan type (821/1418) - attention focused particularly on the portal and qibla iwan, which soared to new heights'. But nowhere has a simple architectural form been managed to give a greater sense of thickness, depth and structural integrity than in the great portal and iwan arches of the Masjid-i-Shah or the mosque of Gohar Shad of Mashhad. By a succession of receding contours, wide soffits with multiple mouldings and deep concave channels, the arch is gradually built up and enriched so that it ceases to be the line of an opening and becomes instead an organised, complicated cluster of repeating forms, heavy strong and wholly adequate. In some of the iwan arches of Gohar Shad, the combined mouldings much reach a total depth of not less than 25 feet and every line and every modulation of the surface, however varied, consistently reinforces the central impression. The Mosque of Gauhar Shad. Among the greatest benefactors of the Shrine was Gauhar Shad, wife of Shah Rukh, and to her piety we owe the magnificent mosque called by her name, which perhaps constitutes the crowning architectural achievement of the Mongols. It is, indeed, a noble quadrangle, with four great arches. That to the south-west, known as the Aywan-i-Maksura^ or "Portico of the Sanctuary," supports a blue dome, and in it the services are held. 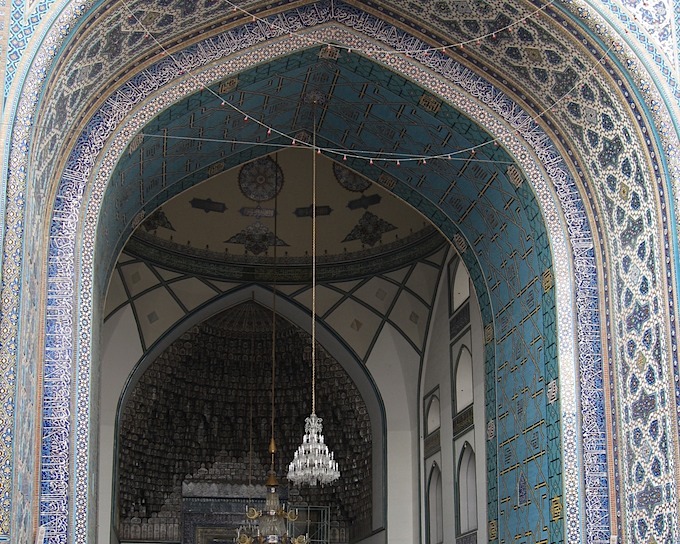 The illustration shows the beautiful tile and plaster work inside the Portico; it also gives the pulpit which, according to Shia belief, will be ascended by the Twelfth Imam on the Day of Judgment [this is not true iranziarat.com]. The loftiness and elegance of the quadrangle, together with its perfect proportions and exquisite tile-work, make it the noblest mosque in Central Asia. In front of the magnificent portico is an inscription in large white letters on a dark-blue ground which struck me as most beautiful. No description of this great mosque would be complete without a reference to the " Mosque of the Old Woman." The legend runs that an old dame who owned a tiny plot of the land required by Gauhar Shad declined to sell it at any price, but insisted that a separate mosque should be erected on it. To the eternal credit of the Royal Consort this unreasonable demand was complied with, and the "Mosque of the Old Woman" testifies to the fact.